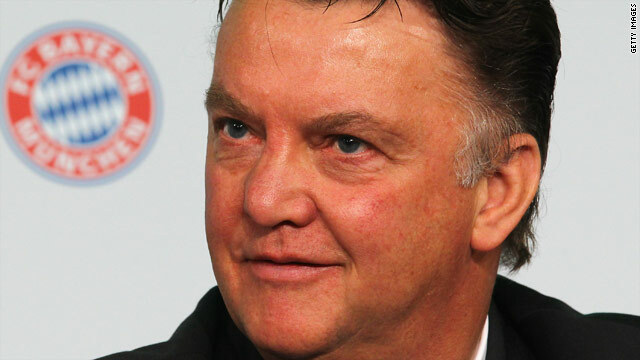 Louis Van Gaal will aim to win his second European Cup on 22 May. (CNN) -- After just one season in charge at Bayern Munich, coach Louis Van Gaal has led the German side to the verge of European supremacy with a place in the Champions League final. The 58-year-old Dutchman will be hoping for his second victory in the tournament which he first won with Amsterdam-based team Ajax back in 1995, when he goes head-to-head with Jose Mourinho's Inter Milan in Madrid on 22 May. Van Gaal will also be attempting to achieve the historic triple having already taken his team to the Bundesliga title and to victory in the German Cup. Things didn't begin so well for Van Gaal's opening season at the Munich club though, and after almost crashing out of the Champions League competition following two successive defeats to Bordeaux, many fans would not have expected their team to reach the final stage. But many are now praising Van Gaal for turning the clubs fortunes around, and neutrals are widely backing him to finish the job at the Bernabeu on Saturday. Van Gaal has won an impressive 18 titles from the four clubs he has managed over the course of his career and some of his greatest achievements arguably come from his time in charge of Ajax in the mid 90's. Winning three Dutch league and cup titles as well as the UEFA Cup in 1992 and Champions League in 1995, Ajax were a dominant force under Van Gaal's reign, providing the majority of players for Holland's national team. Moving onto Barcelona in 1997, Van Gaal led the Spanish side to two La Liga titles. He finally left his position at Barca in 2003 after seeing through a brief spell as boss of the national side between 2000-02. Returning to his home country, Van Gaal went on to manage AZ Alkmaar, a team his steered to the league title in 2009 -- a feat he described as is his "most beautiful achievement" -- before leaving for Bayern Munich. Declaring himself as self-confident, arrogant, dominant, honest, industrious and innovative, at the press conference where he was unveiled as the club's new coach, Bayern boss Van Gaal showed he was no slouch at self-assessment. Such is the dedication he brings to his job, Van Gaal famously shut himself away in a German monastery in 2009 to fast track his learning of the new language. However, Van Gaal will undoubtedly always be remembered for his fiery temper which has seen him clash with some of his players in recent times. He famously let rip at Frenchman Franck Ribery who dared to sit down and take his boots of during a training session on a hot day last year and at Italian Luca Toni, who left Bayern for AC Roma shortly after being reprimanded by Van Gaal for falling asleep at a team lunch. But his meticulous and sometimes harsh style of management has also nurtured some major talents of the game. Van Gaal oversaw the fledgling careers of players such as Patrick Kluivert and Edwin Van der Sar at Ajax. Van Gaal has described his meeting with Portuguese Mourinho in the Champions League final as "God vs The Son of God." Mourinho was an assistant to Van Gaal during his time at Barcelona in the late 1990's, and has often described the Dutchman as his mentor. And Van Gaal is full of praise for his former pupil. "I think I educated him a little. I could immediately see he had an understanding of the game. Jose was very modest back then. It was nice watching his development, to see that he has become such a personality." It is thought that the pair communicate regularly via text message, but despite being friends they are rivals on the pitch. Given their history it is unsurprising the two men have a similar approach to the way they manage their football teams. However, Van Gaal has been keen to point out the differences: "He trains to win. I train to play beautiful football and win. My way is more difficult." Van Gaal will have a full squad of players to pick from on Saturday, with the exception of Ribery who is suspended following a booking in the previous round. It is expected that Turkey's Hamit Altinop will replace him in midfield. Fellow Dutchman Arjen Robben is also expected to play a big role in the match, as the forward is as keen as Van Gaal to beat Jose Mourinho, who he used to play under at Chelsea.